For the first time, we launched a half-year survey about global flight safety this year. 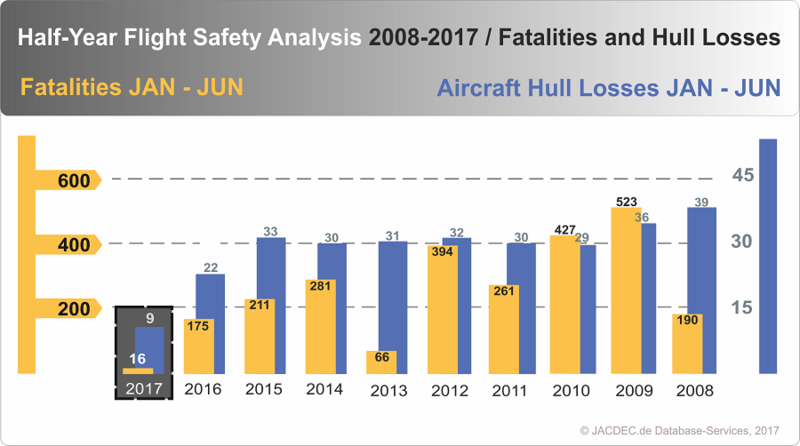 Although the significance of safety data analytics based on a 6 month period is reduced compared to a full-year survey, we do believe one can take meaningful statements out of it as well. So in terms of global aviation safety, one can justifiably call this first interim stock of 2017 as excellent, if not sensational. Well, there are statistics. Thus everyone has the possibility to underline his personal truth with scientific support. However, the area of flight safety is no longer suitable for lengthy discussions. Too long and undisputed, all global institutions report almost unanimously that flying is becoming safer. Much safer as air-travel has ever been before. Although fatality figures were above average in 2014, the general trend towards an ever-lower rate of death in combination with an unbridled passenger growth has been unbroken for more than three decades. Surely one should never praise the day before the evening, but even the records of the last years fade, against the accident figures of the months January to June 2017. All numbers are analysed by JACDEC Database. Only civilian aircraft above 5,7 tons MTOW or 19 seats or greater. On average, 286 people died in the first half-year of the past ten years. In the last five years still 113. The absolute low was reached in 2013 with a record value of „only“ 66 death victims. This year, as you read correctly, we counted a total of sixteen people who had been killed in aircraft accidents aboard civilian airliners. This incredibly good interim outcome is all the more impressive when you look at the distribution of victims by type of traffic. All the dead occurred outside the dominating branch of aviation: Scheduled passenger services shows an unmatched zero fatality rate. However, there were fatalities within on demand (air-taxi) flights, cargo services or other non-commercial flights. Same all time low when it comes to the number of serious incidents: „only“ 93 of such occurrences reported marks a new low for the last 10 years. Nine aircraft were destroyed by accidents. In 2016 it was still 22. The first half year 2017 reflects sharply a long-lasting trend, which goes increasingly in the direction „more passengers with fewer dead“. Certainly, there is always some luck or misfortune in the game whether an accident turned out to be fatal or not, so that you can make informed statements only if you consult a long time axis. Nevertheless, one assertion becomes ever more accurate. Now more than ever, flying remains the safest method to travel longer distances. In most countries commercial aviation as reached a sophisticated and professional level thanks to the implementation of global safety standards for flight operations and government oversight. A joint effort that harvests new safety records and an environment where the likelihood of terrible accidents is shrinking year by year. Of course it is still too early to make any forecasts for the entire year, but even if the rest of 2017 should be halfway as good as the first half suggests it would be another reason for joy. Crashed on go-around manoeuvree in fog. 4 crewmembers and 35 residents were killed. Crashed against mountainside on approach. Wing broke off on hard landing. Aircraft fell down steep embankment ended in trees. Flew too low on approach and crashed against terrain short of runway. Cargo flight. Lost control in a steep turn and crashed into water on a non-revenue flight.